^ Ghosh, A. (1989). An Encyclopedia of Indian Archaeology. New Delhi: Munshiram Manoharlal. p.337; Rao, L.S. (2005–06). 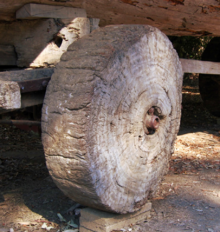 The Harappan Spoked Wheels Rattled Down the Streets of Bhirrana, District Fatehabad, Haryana. “Puratattva” 36. pp.59–67. ^ Jewel, Elizabeth. The Pocket Oxford Dictionary and Thesaurus. Oxford University Press. 2006: 722 [2012-01-04]. ISBN 978-0-19-530715-3. 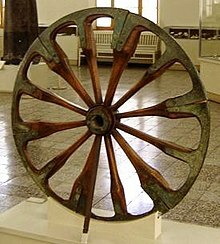 ^ Wheel Structure. Original document: US808765 (A) ― 1906-01-02. Espacenet. 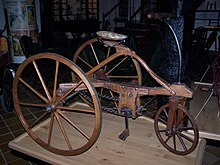 ^ Vehicle – Wheel. Original document: US836578 (A) ― 1906-11-20. Espacenet. ^ Improvements in Spring Wheels for Vehicles. Original document: GB190702860 (A) ― 1907-07-18. Espacenet. ^ Resilient Wheel. Original document: US1159786 (A) ― 1915-11-09. Espacenet. ^ Hall, Adelaide S. A Glossary of Important Symbols in Their Hebrew: Pagan and Christian Forms. 2005: 56. ISBN 9781596055933.